The 2010 European Wine Bloggers Conference (EWBC) took place in Vienna, Austria, from October 22 to 24, with optional wine region excursions from October 25 to 26. Wine bloggers, journalists, wine industry professionals and social media innovators joined together to discuss the convergence between the culture of wine and the internet and to taste and enjoy Austrian wine and food during 5 days full of seminars, wine tastings and vineyard visits. All in all, 30 different countries were represented by the 200 participants. Founded and organized by Gabriella and Ryan Opaz of Catavino, and Robert McIntosh of The Wine Conversation, the 2010 EWBC was the third European conference, following the 2008 EWBC in La Rioja, Spain, and the 2009 EWBC in Lisbon, Portugal. In addition there has been a number of US conferences, with the North American Wine Bloggers Conference in Walla Walla in June of this year attracting over 300 wine bloggers. The 2010 EWBC took place in the Schoenbrunn Palace, which, together with its ancillary buildings and extensive park, is by virtue of its long and colorful history one of the most important cultural monuments in Austria. The event would not have been possible without the generous support of several sponsors, notably the Austrian Wine Marketing Board, Wienwein, an association of the 6 leading wineries of Vienna, and regional wine associations from Burgenland, Traisental-Kamptal-Kremstal and Weinviertel. The first day started out with a walk-around tasting ; there were about 20 tables. Among them was Klaus Wittauer (KWSELECTION) from Virginia, one of the leading importers of Austrian wines into the US. In the first key note speech, Elin McCoy, Bloomberg, author of the book The Emperor of Wine: The Rise of Robert M. Parker, Jr. and the Reign of American Taste talked about the change from the old system of wine criticism (the ivory tower critics) to the new system of wine citizen bloggers. The younger generation is now used to sharing opinions and tasting notes with their peers on blogs, Facebook, Twitter, etc. Clearly Elin sees the era of the wine critic gurus ending. This was followed by a various streams of smaller workshops on subjects as: The Basics of Social Media. How Audio and Video can transform your blog, How to develop a global online community for your personal brand, How to track and measure all your social media activity, Sharing through Twitter, Facebook and other social networks, Gadgets and technology: iPhone, Ustream, QIK, Twitterific, Tweetdeck, Google Alerts etc. In the final session Willi Klinger, head of the Austrian Wine Marketing Board, brilliantly lead a technical tasting of Austrian wine. The vineyards in Austria cover 51,000 hectares which generally lie in the east and southeast of the country. Austria as a wine producing country is divided into 4 wine growing regions of which Wien, Austria’s capital, makes up 700 hectares of vineyards. In the tasting seminar, the Rotes Haus Gemischter Satz 2009, by Gerhard Lobner, was voted the crowd’s favorite, and listed online with UK wine retailer Naked Wines. The evening ended in a Heurigen, a traditional wine tavern, were the winemakers group WienWein offered a fabulous dinner and presented their wines. Again a series of workshops, as well as round table discussions and another possibility for exploring Austrian wine at the walk-around tasting. Robert McIntosh of The Wine Conversation moderated a round table with George Sandeman from Wine in Moderation, Ken Payton, Founder of Reign of Terroir, and Adam Watson-Brown, Head of Sector of the Directorate-General Information Society & Media of the European Commission on the influence wine communicators have upon the consumer. Issues that came up included the practical experiences of the Wine in Moderation campaign, the future impact of EU regulations on online wine communication, and ethical issues that come from being a citizen wine critic. Julia Sevenich, Wine Publicists and Author of Uncorked in the Alps moderated a round table with Rowan Gormley, Founder and CEO of Naked Wines, Evelyn Resnick, Author of Wine Brands, and Andre Ribeirinho, Founder and CEO of Adegga.com on how the growing number of bloggers and online wine lovers is changing how we buy and sell wine. In the second key-note speech, Evan Schnittman, Managing Director of Group Sales and Marketing, Print and Digital, at Bloomsbury, talked about the past, the present and the future of digital and print publishing. His thesis is that print and digital can co-exist. The last session was a technical tasting of Chilean wine. Chile – a land of beautiful contrasts, rich in cultural diversity, and producing some of most exciting and naturally organic wines in the world Chile’s wine regions lie to the north and south of the capital city Santiago. Historically famous for its rich Cabernets and Merlots, modern Chile is now also being praised for its ability to impress with Sauvignon Blanc, Pinot Noir, Syrah and its very own red grape Carmenère – deep in color and rich in anti-oxidants. Towards the end of the conference’s formal sessions, the organizers Robert McIntosh, Gabriella and Ryan Opaz announced that they are setting up a new series of awards for on-line journalism called Born Digital. The awards will recognize writers and artists for text, video and audio articles online. The judging panel will be made up of wine industry professionals, including Jancis Robinson and Elin McCoy. The evening ended with a fare-well party at the trendy Vienna restaurant and wine bar Zum Oesterreicher, with outstanding finger food and an opportunity to taste a huge selection of Austria’s top wines. We split up and went on 3 EWBC conference trips, to the Weinviertel, the Burgenland and the Danube region. I chose the Weinviertel trip and will report separately about it. Participants had the option to choose among 2 2010 EWBC post-conference trips. First, Kremstal DAC, Kamptal DAC and Traisental DAC - this trip was supposed to show us Austria’s new origin-typical wines: Grüner Veltliner and Riesling from the Kremstal, Kamptal and Traisental DAC-regions. The first day began at the Stift Göttweig monastery, followed by a tasting of Kremstal DAC wines. Then, in the romantic region of Traisental, participants tasted freshly picked grapes and could see how they were processed. A tasting of Grüner Veltliner and Riesling musts in different stages of fermentation helped participants to more about these varieties before tasting Traisental DAC wines. The next day featured a visit to the Kamptal, where participants assisted in the harvest at the Heiligenstein, the most famous single vineyard of the region. Afterwards, Kamptal DAC wines were waiting for them in the famous wine museum, Loisium. Second, Burgenland - Leithaberg DAC, Mittelburgenland DAC, Eisenberg DAC. The Pannonian Plains of Hungary meet the last foothills of the Alps on Lake Neusiedl in Burgenland. Just as the landscape is diverse and stunning – so also are the wines of Burgenland. These encompass not only the dry, mineral, vibrantly structured white wines from the slopes of the Leithaberg, but also exquisite sweet wines from the shores of Lake Neusiedl. Burgenland is also Austria’s predominant source for superb red wines, in particular from the indigenous Blaufränkisch variety. On this trip participants had the chance to compare the inimitable terroirs of the Burgenland appellations Leithaberg DAC, Mittelburgenland DAC, and Eisenberg DAC, encounter state-of-the-art winery architecture and meet numerous vintners. Because there is no end to food pairing options with the wines of Burgenland, participants had the possibility to experience this versatility with a hearty, rustic meal in regional wine tavern as well as in a fine restaurant with haute cuisine. I chose the Burgenland trip and will report about it separately. The 2011 European Wine Bloggers Conference will be in Franciacorta (Italy) next year from October 14 to 16. Follow the Twitter Hashtag #ewbc. South Africa is a New World wine country, with a long wine history. With about 100.000 hectares of land under vine, it accounts for 1.5% of the world's grape vineyards. Yearly production is around 10 million hectoliters, which puts the country among the top ten wine producing countries in the world. I have traveled in South Africa many times in the past 3 decades, in particular during the period 1989 to 1992, when I used to live in Madagascar. This posting was drafted after having spent 5 weeks in the country in 2010. More postings will follow on, inter alia, the wines (and the people behind them) of Boekenhoutskloof, Tokara, Devon Rocks, Dornier, Ruste en Vrede, Marianne Wine Estate, Stellekaya, Glen Carlou, Diemersfontain, Hamilton Russel and Allesverloren. When traveling in South Africa today, it quickly becomes evident that apartheid is resting in the dustbin of history. South Africa’s current President is the Zulu Jakob Zuma, who is mired in personal and political controversy. The Txosa Nelson Mandela, who had spent more than 25 years in prison during apartheid, was President in the 1990s and is now a revered elder called "Madiba" ("Papa"). South Africa successfully hosted the Soccer World Cup. The Soccer World Cup was hoped to provide a boost to the tourism industry; but indications are that the expected boost did not materialize, at least not fully. The gap between the haves and have-nots continues to be wide, but is narrowing and a black middle class is emerging. This, however, is not so much evident in the wine region, which continues to be dominated by the whites; Cape Town even has a white mayor. 99% of the vineyard area is in the hands of whites. The AIDS pandemic is taking a huge toll with the HIV infection rate at about 20 percent. Over the course of the years, I have detected an increasing openness, pride and camaraderie among all the South Africans – white, colored or black, Boers or Brits; Indians, Jews, Zulus, Txosas or Vendas, I met. Nevertheless, this rainbow society with a share of 75% of blacks, has huge challenges to cope with. It all began in 1655, with wine seedlings from Europe, ordered by the commander of the newly formed station of the Dutch East India Company - the largest company in the world at the time - at the Cape, the Dutch surgeon Jan van Riebeeck. He knew that for the long ship journey from Europe to India around the Cape of Good Hope, wine was better than water as the latter often got rotted in the barrels, causing the dangerous scurvey for sailers. Four years later, in 1659, Jan van Riebeeck made his first wine in South Africa. Before the arrival of the European settlers, African tribes had settled in the area. Today, the most influential African tribes are the Xhosas (the most famous Xhosa is former President Mandela) and the Zulus (the most famous Zulu is current President Zuma). Among the white settlers were former sailors, adventurers and people who left Europe for religious reasons. The latter included the Huguenots who had fled to Holland to escape religious persecution. Many of them settled in Franschhoek and brought wine-making know how to the Cape region. Another mile stone in the wine history of South Africa is the pioneering work of the Boer Governor Simon van der Stel. He founded the famous Constantia Estate that is viewed as the nucleus of the South African wine industry. As the 18th century drew to a close, the Dutch power began to fade worldwide, and the Cape region fell under British rule. When the Brits arrived, 25000 white mainly Boer colonists lived in the region; they were pushed up to the north as the Brits took over the region. As a result of the British rule, the South African wine industry blossomed as it benefitted from preferential treatment in the British market. By 1859 more than 4 million liters of South African wine were exported to Britain. This changed dramatically when as the result of the Cobden-Chevalier Treaty in 1861 the preferential tariffs were abolished helping French wine exports to regain the British market. By 1865, exports had dried up to a mere 0.5 million liter. The turn of the century saw a large overproduction of wine in South Africa. To cope with the surplus, the South African winemakers formed a wine cooperative in 1918, the Kooperatieve Wijnbouw Vereniging van Zuid Afrika (KWV). Initially started as a cooperative, the KWV soon grew in power and prominence to where it would to set policies and prices for the entire wine industry. At the same time, in the second half of the 1900s, the trade barrier of anti-apartheid sanctions ensured that South Africa’s wine exports fell to virtually zero and that the tiny domestic market became the industry’s only consumer. It was not until the end of apartheid in 1993/94 that the wine industry started to see a brighter future again, and the renaissance of the South African wine industry began. This renaissance was fueled by a rapid increase of foreign demand for South African wine and substantial investments, financed by foreigners as well as locals. Most of the wineries I visited in October 2010 had come into existence only after the collapse of the apartheid regime. Today, South Africa is a New World wine country, with a long wine history and tradition of winemaking. Unlike other New World wine regions, the South African wine industry is strongly influenced by several large wine-cooperatives, including Distel and KWV; in total, there about 60 co-operatives. 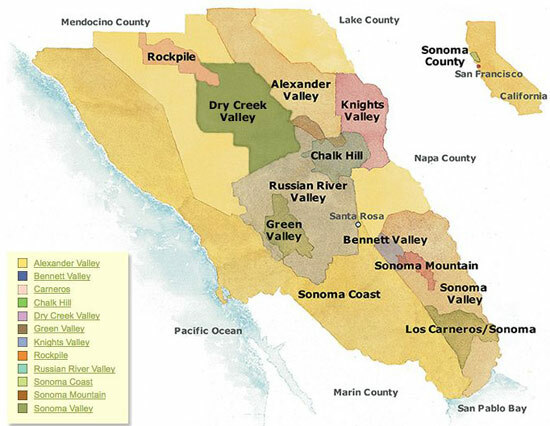 In addition, there are about 25 trading companies, or negociants, which often operate wineries, but seldom own their own vineyards. Among these are SAVISA, Winecorp, Stellenbosch Vineyards and Graham Beck; Western Wines is among the trading companies that are foreign based and owned; their brand Kumala is by far South Africa’s biggest brand. Over 80% of the total crop is delivered to these large wineries by about 4000 wine growers. However, private wineries have increasingly emerged and seen an impressive growth; there are now about 600 winemakers with their own cellars, most of them in the premium wine segment. More than half of the total production is exported. The previous Cape powers, the UK and Netherlands, are traditionally the main destinations for wines shipments; but other markets are coming up, including Sweden, Denmark, the USA, Germany and Angola. The wine industry is firmly in the hands of the whites, both white South Africans and foreign investors. But I had the pleasure to meet Ntsiki Biyela, a female black winemaker, who is producing outstanding wines at Stellekaya in Stellenbosch. Also, the Diemersfontein wine portfolio included a line of wines that was produced in the framework of the Black Economic Empowerment (BEE) program (to promote the black community's involvement in the South African wine industry-including ownership opportunities for vineyards and wineries). Although there has been a significant shift in favor of red wine varieties, reflecting increasing demand for the international varieties Shiraz and Cabernet Sauvignon, white wine is still in the lead, accounting for a bit more than half of the total. Pinotage, which is a native grape of South Africa, also shows an upward trend. Among the white wines, Chenin Blanc is the front runner, followed by Chardonnay and Sauvignon Blanc. Cabernet Sauvignon has become the most widely planted red grape variety, accounting for 25 percent of the red wines. Shiraz seems to like the climate of the Cape very much and produces very intense full-bodied wines. In recent years, Shiraz has been planted in particular in the warmer growing areas. Although Pinot Noir is rarely grown in South Africa, it can be found in the cooler regions Walker Bay and Elgin, producing exceptionally good wines there. Merlot has traditionally been used for cuvees with Cabernet Sauvignon; but winemakers have started to produce 100% Merlot wines. Pinotage is the signature grape of South Africa. In 1925, a South African researcher at the University of Stellenbosch crossed the Pinot Noir with the Hermitage (Cinsaut): This was the birth of Pinotage. It now accounts for more than 20 percent of South Africa’s red wine. It is made in a broad range of styles, from easy-drinking quaffing wine and rosé to barrel-aged wine intended for cellaring. It is also used for port-style wine and red sparkling wine. In recent years, many new Chardonnay vineyards have moved into the production phase. Whether fermented in barrels or in steel tanks, the Chardonnay from the Cape region is always elegant in style, combined with refreshing fruit flavors on the palate. Viognier shows its full potential in South Africa and plantings are increasing. Two hundred years ago, Semillon was the dominant grape variety in the Cape region; today it is rather the exception. South African Sauvignon Blancs enjoy an increasing popularity; the plantings are concentrated in the cooler altitudes of Constantia, Paarl and Stellenbosch. Although on a downward trend, some South African wine makers are pushing the Chenin Blanc grape, trying to improve the quality and diversifying into different styles. Other white varieties include Colombard, Gewurztraminer, Muscat of Alexandria and Pinot Gris. Finally, Cape Riesling is widely grown in the Cape, but is actually not a Riesling, the great grape from Germany, but a Crouchon Blanc, originating in Southern France, but seldomly grown there. By contrast, the noble Riesling is a niche wine, which, until this year, had to be labeled as Weisser Riesling or Rhine Riesling. Only from this year on, Riesling can be labeled as Riesling, without the pre-fixes Weisser or Rhine. Under the "Wine of Origins" (WO) system, wine zones fall under one of four categories. The largest are Geographical Units (such as the Western Cape region), which includes the smaller, but still largely defined Regions (such as Overberg), followed by districts (like Walker Bay) and finally wards (such as Elgin). WO wines must be made 100% from grapes from the designated area. Constantia ward: Located south of Cape Town on the Cape Peninsula that juts out into the Atlantic ocean, it is the cradle of the South African wine industry and was through the 18th and 19th centuries regarded as South Africa’s grand cru territory. Stellenbosch district: the second oldest wine zone, accounting for around 14% of the country's wine production. The seven wards of Stellenbosch-Banghoek, Bottelary, Devon Valley, Jonkershoek Valley, Papegaaiberg, Polkadraai Hills and Simonsberg-Stellenbosch are well known for their red wines. Paarl: For most of the 20th century, Paarl was for all practical purposes the heart of the South African wine industry, as it was the home of the KWV. The importance of Paarl has declined with the emergence of a strong private sector. The Franschhoek Valley, a ward, was founded by Huguenot settlers who brought with them their winemaking know-how. The Breede River Valley, located east of the Drakenstein Mountains, is a warm climate region; the river itself provides easy access to irrigation which makes bulk wine production of high yield varieties commonplace. The Robertson district is located closest to the river along alluvial soils. The Worcester district is responsible for more wine than any other wine region in the country with almost one quarter of the total coming from this area. The cool climate Overberg region received very little attention until the late 20th century, but its wines are becoming increasingly sought after, notably the wines of Walker Bay with the various Hemel-en-Arde wards and of the cool, higher elevation vineyards of Elgin located east of Cape Town. The Atlantic influenced West Coast region includes the areas of Durbanville, Olifants River, Piketberg and Swartland. Historically known for its bulk wine production, in recent years, in particular in Swartland, innovative producers making excellent premium wines have emerged. The South African wine industry has a long history of sweet, fortified and sparkling wines. In the Cape, there are two important sweet wine styles: First, the (botrytised) noble-sweet wines are known as Edel Laat-oes wines. Wine labeled simply as Laat-oes are from grapes harvested late but not infected with botrytis. Colloquially known as "Cape Port", port-type wines are made from a variety of grapes, such as Shiraz and Pinotage. The styles of "Cape Port" parallel closely their Portuguese counterparts. South Africa also produce sherry-type wines produced in a solera system. Finally, sparkling wines are produced with both the Charmat and the traditional Champagne Method. To distinquish South African sparkling wines (and to now comply with European Union regulations) made in the traditional bottled fermented method are now labeled as Cap Classique. These wines have been traditionally made using Sauvignon Blanc and Chenin Blanc, but recent years have seen an emergence of the traditional Champagne grapes Chardonnay and Pinot Noir. Dirk Wuertz is a winemaker from the Rheinhessen region Germany. He is different from the mainstream German winemakers in various respects. First, he exports a large share of his wines; most German winemakers do no export wine. Second, he is the leader in terms of social media in the German wine industry. Twitter and Facebook are only slowly entering the German wine industry and most winemakers do neither have a Twitter nor a Facebook account. Dirk is the most popular wine blogger in Germany. In January of this year, Dirk even launched his own internet TV show “100 Grad Oechsle”. This is a very professionally made one- hour talk show with prominent guests from the wine industry. Third, he sells his wines not only in bottles, but also in bags-in-a-box; very few in Germany do this. One noteable exception is the Gunderloch Estate, also from Rheinhessen and also very present in the US market; they sell the wine “Fritz” in a bag-in-a-box. I had the pleasure of meeting Dirk recently in the Restaurant Freudenhaus in Hamburg during the production of Hendrik’ Thoma’s TVINO Late Night Show. See here. Rheinhessen is the largest viticultural region in Germany. Every fourth bottle of German wine comes from Rheinhessen. About one third of Rheinhessen’s agricultural area is cultivated with vines, more than 26000 hectares. The high-yielder Mueller-Thurgau accounts for about 1/5 of the vineyards, and Silvaner and Dornfelder both for 1/10. Riesling is on the backburner. Unlike in other German wine regions, where monoculture of the vine is the norm, here the many rolling hills are host to a wide variety of crops grown alongside the grape. Rheinhessen also has the rather dubious honor of being considered the birthplace of Liebfraumilch. At the same time, Rheinhessen is at this time among Germany’s most interesting wine regions. A lot is happening there. This is not because of the terroir, but because of the people. There is an increasing group of young, ambitious and dynamic winemakers who want to produce and indeed do produce outstanding wine and not wines in large quantities. Dirk Wuertz is on of them. Bag-in-a-box wines are not yet very popular neither in Germany nor the US, but are slowly gaining friends. Bag- in-a-box wines – in a resealable plastic bag in a cardboard box – have many advantages. Unlike a bottle, which goes bad after a few days even when you pump the air out or spray preservers in it, wine in a box lasts. Inside the box, the wine bag collapses as you drink and the liquid doesn't get exposed to oxygen. It is also very advantageous in terms of carbon footprint. The problem? Not enough winemakers are putting good wine in boxes. Dirk Wuertz is one of the exceptions. Dirk Wuertz’s bag-in-a-box Riesling is available in the US market for around $ 23. This is a bit less than US$ 6 per bottle. I tasted it. Here are my tasting notes: straw color in the glass, attack of juicy green apple, pineapple and lemon on the nose, a light-bodied wine, fresh , crisp and bone-dry, good acidity, notes of nuttiness and muskiness with some petrol on the palate, refreshing finish, a very good party wine. One place that serves the Wuertz bag-in-a-box Riesling is the trendy wine bar Ten Bells in lower Manhattan. They focus on natural, organic wines. In addition to wines procured from small producers in Europe, Oregon, and Morocco, the 30-seat spot serves cheese, cold cuts such as wild-boar sausage and bresaola carpaccio, and small dishes such as duck-breast salad with hazelnuts. When I was there I had oysters with the Wuertz Riesling. See here. In addition to being a gifted winemaker, Dirk is also good-looking. He has taken advantage of this and has posed naked for the box of his new bag-in-a-box wine “Mein Wein”. Of course, this kind of box is not available in the US, but mainly selling in the Scandinavian market. The drawings come from Siri Petterson, one of the best know cartoonists of Scandinavia. I tasted the Dirk Wuertz Mein Wein during Hendrik Thoma’s TVINO Late Night Show taping in Hamburg: Fresh, crisp, bone-dry, good acidity, hints of tropical fruits, nice finish, good party wine. Pictures: Christian G.E.Schiller, Dirk Wuertz and his "Mein Wein"
Pete Seghesio Jr., CEO of Seghesio came to Washington DC to present his wines at Pearson’s. The Seghesios are one of the pioneering families in Sonoma County's wine industry. Their story begins in 1886 when Eduardo Seghesio departed his family's vineyards in Piedmonte, Italy for a new life in America. Like so many immigrants, he was drawn to Northern Sonoma County and the Italian Swiss Colony. The "colony," as it was known, hired immigrants for three year stints, providing room and board and then, a lump sum at the end of those three years enabling employees to buy land or set up a business in their new home. Soon, Eduardo rose through the ranks to winemaker. In 1893, he married a young girl, Angela Vasconi, also from Italy . In 1895, they purchased a modest home in northern Alexander Valley, less for the home than the surrounding 56 acres Eduardo recognized as ideal vineyard land. They planted the "Home Ranch" that year to what has become the family's lifeline - Zinfandel. Eugene Pio Seghesio, the son of Angela and Eduardo Seghesio, joined the family winery in 1941. During his tenure, Seghesio became a leading bulk producer, but he also started the process that would see the winery transformed to one of the world's premium producers of Zinfandel. While this transformation took place during the tenure of Eugene Pio, it was engineered by 2 Seghesios from the third generation: Eugene Pio’s son Pete Jr. Seghesio, who became the CEO (and who led the tasting), and Eugene Pio’s nephew Ted Seghesio, who became the winemaker. They trimmed production from 130.000 to 40,000 cases. The first wines bottled under the Seghesio label were released in 1983. Today, all Seghesio wines are sourced from the four hundred acres that the Seghesio family owns and operates in Alexander Valley, Dry Creek Valley, and the Russian River Valley as well as another 100 acres leased on a long-term contract. 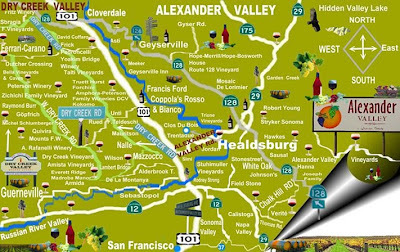 The Alexander Valley is located north of Healdsburg in Sonoma County. It is the largest and most fully planted wine region in Sonoma. The Russian River flows down the valley, surrounded by vineyards on both sides. Viticulture dates back to the mid-1800s, when Cyrus Alexander established vineyards in the area. For most of its history, the region was predominately associated with mass-produced bulk and jug wines. The modern era of quality wine production began in the late 1960s with Simi Winery starting to produce wine in the Alexander Valley. The Alexander Valley is known for a wide range of grape varieties but in recent years the area has been noted for the quality of its Cabernet Sauvignon and Merlot wines. Jancis Robinson has speculated that Zinfandel and Sauvignon Blanc may prove themselves to be best suited to the climate and soils of the Alexander Valley. Zinfandel is a red grape variety planted in over 10 percent of California vineyards. It was long considered to be the “American Grape”. But new research revealed that it is genetically equivalent to the Croatian grape Crljenak Kaštelanski, and also the Primitivo variety traditionally grown in the "heel" of Italy, where it was introduced in the 1700s. The grape found its way to the United States in the mid-19th century. The arrival of Zinfandel in the US may have been via the Imperial Nursery in Vienna, Austria, which likely obtained the vines during the Habsburg Monarchy's rule over Croatia. After World War II, medium sweet White Zinfandel became immensely popular in the US. At the end of the end of the 20th century, red Zinfandel wines came back into fashion. In 1895, Eduardo Seghesio chose the western bench of Alexander Valley as his stake In the New World and planted his first vineyard to Zinfandel. The absence of marine influence marks this growing appellation. Long, warm days create an environment that enables noble red varietals to excel. With only 8-16 inches of topsoil and clay soils with varying underlying layers of basalt, sandstone, and serpentine rock, vines have a difficult time surviving. The resultant lower yields produce grapes with incredible concentration. Total Acreage: 190 acres (primarily Zinfandel with Petite, Cabernet, Sangiovese, Barbera, Aglianico). 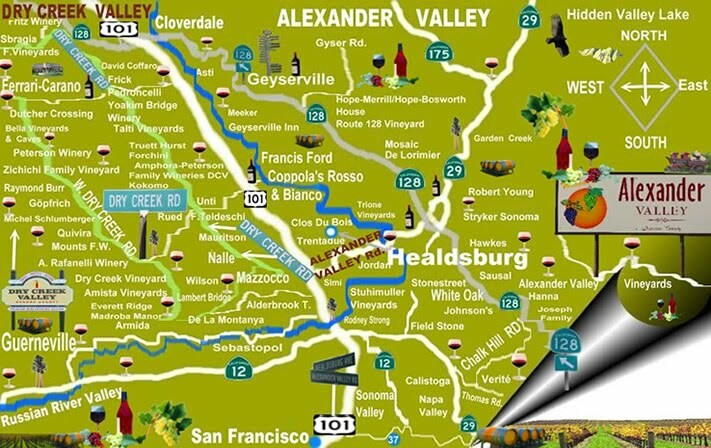 Located on the eastern bench of northern Alexander Valley, River Road is the warmest of the Seghesio vineyards. Yolo and gravelly, sandy loams are the result of this vineyard's proximity to the Russian River. Total Acreage: 56 acres (100% Zinfandel). Climatically, Alexander Valley tends to be warmer as one moves north up the valley. The Lone Oak Ranch is in an area that is slightly cooler than the Home Ranch. The well-drained soils here are comprised primarily of gravel (Yolo) based loams. Total Acreage: 25 acres (100% Zinfandel). Nestled in the heart of Dry Creek Valley, Cortina's climate reflects both coastal and inland influences. Mornings shrouded in fog are followed by long hours of sunshine. The soils at Cortina are diverse, consisting primarily of loam (Yolo) interlaid with gravelly loam (Cortina) ideal for Zinfandel. Total Acreage: 56 acres (primarily Zinfandel). San Lorenzo was planted in the early 1890s, making it the oldest Seghesio vineyard. Ideal for Zinfandel, San Lorenzo’s bench lies in the Southeast Alexander Valley above the fog layer and is rooted in clay loams. Total Acreage: 32 acres (Zinfandel and Petite Sirah). Located in northern Russian River Valley, this vineyard's microclimate is tempered by cool coastal breezes and frequent summer-morning fog. These climatic conditions provide an optimum growing environment for Pinot Noir, Chardonnay, Pinot Grigio, and Arneis. The soils are composed of gravel and clay loams. Total Acreage: 72 acres (Pinot Noir, Pinot Grigio, and Arneis). Here are the wines Peter poured, with his notes. Winery Notes: “Arneis originates from the hills of Roero, northwest of Alba in the Piedmonte region of Italy from which our grandfather, Edoardo Seghesio, emigrated in 1886. First noted in Italian records as far back as 1478, Arneis’ production grew as it was often planted among rows of Nebbiolo to lure hungry birds away from the more prized red grapes. Arneis’ literal translation is "little rascal," due to the viticultural challenges it presents in the vineyard. Winery Notes: “Our family has grown grapes in Sonoma County since 1895 and, in Russian River Valley, since 1961. A decade ago, we began an aggressive move toward producing all estate wines which included an extensive vineyard-replanting program. Winery Notes: “Our family roots are firmly planted in Zinfandel, as our great-grandfather, Edoardo Seghesio, first planted this intriguing varietal on our Alexander Valley Home Ranch in 1895. Today, we share his passion and, reverently, farm over 250 acres of estate Zinfandel in Alexander and Dry Creek Valleys.This wine combines sites that have produced Zinfandel for over a century with newer sites that utilize proprietary clones and the most advanced viticultural practices. Climatic-induced spicy undertones mark the 2008 vintage. Vibrant display of acidity enhances the briary raspberry and blackberry varietal expression. Lush, velvety mouth feel interwoven with fine, integrated tannins creates a smooth richness. Full-bodied, juicy mid-palate with Seghesio "balance." Robert Parker’s The Wine Advocate 89 points: "The 2008 Zinfandel Sonoma offers up copious amounts of blue, red, and black fruits as well as excellent purity, medium to full body, a supple texture, and enough acidity to provide vibrancy. It is a pure, elegant, substantial Zinfandel to drink over the next 3-4 years." Winery Notes: “Edoardo Seghesio immigrated to America in 1886 from the Piedmont region of Italy, home to Barbera. In 1895, he planted his first vineyards to grapes he had come to enjoy in his new country; yet one vineyard was saved for varietals from his homeland. Our Barbera clones were found in that century-old vineyard. Subsequent Barbera plantings on the Home Ranch benefit from northern Alexander Valley’s warm, dry days where the grape’s classic acidity creates a wine with vibrant aromas and a velvety texture. Barbera's dark ruby/purple color is followed by loads of briery, berry fruit, earth, herbs, pepper, and spice. Gutsy and zesty, it is a delicious, medium-bodied red with abundant personality. Enjoy it over the next 3-4 years." Rebgarten is a wine store in Berlin that sells only bio-wines. This year, it celebrated its 25 Anniversary. My wife and I swung by the tasting on the occasion of the Anniversary and were happy to bump into two winemakers, Lotte Mueller-Pfeffer from Weingut Brueder Dr. Becker (and current President of Ecovin) and Paulin Koepfer from Weingut Zaehringer, we know well. Rebgarten is the leading wine store for bio-wines in Berlin. It all started 25 years ago with a few boxes of bio- wine from the Pfalz and the wine cellar in the Bergmann Strasse in Berlin-Kreuzberg. Since then, Rebgarten has transformed from a little wine cellar to a well established wine store. Over time, the German wine portfolio has been deepened and broadened and complemented with imports from France, Italy, Spain and Austria. Today the wine portfolio comprises approximately 400 wines from all major growing areas of Europe. A special focus however remains on German wines. What are bio-wines? Generally speaking, wines made with an ecological concept in mind. However, there are many different approaches in terms of what that implies in reality. I addition, there are winemaking concepts that belong to the larger family of “green” wines. Organic generally means the use of natural as opposed to chemical fertilizers, insecticides and pesticides. The key is: no chemicals. Organic wines are changing the look of vineyards, literally. Whereas vineyards of the past commanded neat rows rid of all insects, rodents and weeds, organic vineyards are now replacing costly and damaging chemical sprays with environmental partnerships. Pesticides are giving way to introducing low-growing plants between vine rows that host beneficial insects that keep the pest insects in check. Biodynamic is similar to organic farming in that both take place without chemicals, but biodynamic farming incorporates ideas about a vineyard as an ecosystem, and also accounting for things such as astrological influences and lunar cycles. Biodynamic is an approach following the rules and ideas of Austrian philosopher-scientist Rudolph Steiner. In his 1924 lectures, he viewed the farm as an entire living ecosystem starting with the soil which is treated as a living organism and receives special applications to enhance its health. Sustainability refers to a range of practices that are not only ecologically sound, but also economically viable and socially responsible. Sustainable farmers may farm largely organically or biodynamically but have flexibility to choose what works best for their individual property; they may also focus on energy and water conservation, use of renewable resources and other issues. The idea behind natural wine is non-intervention and a respect for nature. For example, only natural yeasts are used, the fermentation is slow, there is little or no use of new oak barrels; and there are no filtrations or cold stabilization. Natural wines are minimalist wines produced with as little intervention as possible. Vegan refers to the process of "fining" the wine. Proteins, spent yeasts and small organic matter in wines are sometimes eliminated from wines with fining agents made from animal products. Fish bladders, egg whites, milk proteins and even bull’s blood (not allowed in the US or France) are all used as fining agents. As an alternative, Bentonite, a specific type of clay, is used for clarification in vegan wines. It’s important to note that vegan or vegetarian wines may or may not be made from organic grapes. Fair trade wines first came onto the market the US in 2007, following trends in coffee, tea and produce. Fair trade refers to the conditions and wages paid to employees of the winery; it guarantees employees a fair and "livable" wage for their product. Fair Trade certification of wine has been around since 2003 in Europe. The certification means that wineries met certain standards for living wages, environmental sustainability and community improvement. Oakland's TransFair USA just announced that it has begun certifying Fair Trade wines from Argentina, Chile and South Africa for the American market. The carbon neutral label comes from a different angle: global warming. All economic activites have a carbon footprint, including wine making. Carbon neutral wineries are trying to make a contribution to the general efforts of reducing the emission of carbon dioxide. A major aspect of carbon neutrality however is outside the control of wineries. It is the transport of the wine from the winery to the consumer. For example, the carbon dioxide emission of a Bordeaux send to New York City by ship is lower than that of a California wine transported on the road. A new thing is water footprint, reflecting the concern that the planet is moving into a period where water becomes more and more scarce. Weingut Brueder Dr. Becker is one of the few Wine Estates in Germany that is, at the same time, a member of the VDP, the group of elite winemakers, and Ecovin, a group of winemakers following ecological principles. Ecovin is an association of winegrowers in Germany whose nearly 200 members with 1.000 ha vineyards are practicing organic viticulture according. To date about one percent of viticulturists in Germany produce wine according the Ecovin guideline. Lotte Pfeiffer-Mueller, co-owner of Weingut Brueder Dr. Becker, is the Chairwoman of the Board of Ecovin. The Estate is located in Ludwigshöhe in the Nierstein area Rheinhessen. It was founded in the early 20th century by the two brothers Dr. Johann and Dr. Jakob Becker. Today, it is run by Lotte Pfeffer-Müller and Hans Müller, the third generation of the family. The vineyard area totals 11 hectares and is planted with Riesling (4 hectares), Silvaner, Scheurebe, Pinot Noir, Müller-Thurgau, Pinot Gris, Pinot Blanc, Regent and Gewürztraminer. Organic viticulture has been practiced since the mid 1980’s. An own weather station was installed in the vineyards to assist in determining the optimum time for picking. Wines are matured either in stainless steel or in traditional oak barrels, and in the case of the Pinot Noir also in barriques. Bottle-fermented sparkling wine is also produced. The Muellers have about 40 wines on their wine list. 3 of the 4 Liter wines are dry and the Scheurebe Liter wine is medium-sweet. The Riesling Liter wine costs Euro 6. There is the whole range of Scheurebe wines from the medium-sweet Liter wine to an amazing 1999 Scheurebe Trockenbeerenauslese for Euro 45. In addition, I found a delicious Scheurebe Sekt on the list for Euro 9.80, also medium-sweet. About half of the wines are dry. The overwhelming majority of the wines is white, with Riesling dominating. 3 Grosses Gewaechs wines from the vineyards Tafelstein and Falkenberg stand out, for Euro 18 to 19. The wine list also includes 3 noble sweet wines, including the already mentioned Scheurebe Torckenbeerenauslese, and 4 sweet Auslese wines. Weingut Zaehringer was the only German exhibitor at last year’s Millesime Bio, on which Annette Schiller has reported here. The Millésime Bio in Montpellier is the only wine trade show worldwide exclusively consecrated to the organic winegrowing sector. Over the years, the Millésime Bio has grown from a small local trade show, organized by organic winegrowers of the Languedoc-Roussillon region, to a powerful demonstration of wines stemming from environmentally friendly, health-focused winegrowing with an all time high number of 489 exhibitors and 2700 visitors in 2010. Although about eighty percent of exhibitors were winemakers from France, the international exhibitors comprised thirteen countries, with Spain and Italy in the lead. Paulin Koepfer is also President of the Baden chapter of Ecovin. Since 1844 the Weingut Zaehringer makes wine in the Markgraeflerland, in southern Germany right across the Rhine River from the Alsace region. This region benefits from lots of sunshine, a good terroir, and a mild climate that favors varietals such as Chardonnay and Pinots. Annette had been very impressed by the Zaehringer wines at the Millesime Bio 2010, where she had tasted the entire portfolio of the Zaehringer wine, a beautiful sparkling wine, the Chardonnay, the 2008 Gutedel, and of course the Pinot Blanc, Pinot Gris and Fruehburgunder (there is not really a translation for this varietal, one could call it a Premature Pinot Noir). At the time, Annette felt that the Zaehringer wines showed the earthiness, boldness, terroir, and elegance only detectable in natural, handcrafted wines. This impression was confirmed at the Rebgarten in Berlin. The 5. German Pinot Gris/Grauburgunder Award Competition took place in Germany a few weeks ago. Most of the submitted wines were from Germany, but a few other old world producers also participated in the contest. Grauburgunder is better known as Pinot Gris or Pinot Grigio in the world, a mutant clone of the Pinot Noir grape. Total production area in the world is about 15.000 hectares. Pinot Gris has been known from the Middle Ages in the Bourgogne region in France. It spread from there, along with Pinot Noir, to other European. The grape was a favorite of Emperor Charles IV, who had cuttings imported to Hungary and Bohemia. A German merchant by the named Johann Seger Ruland (re)discovered a grape growing wild in the fields of the Pfalz region in Germany in the 1700s. The wine he produced became known as Ruländer; the Rulaender was later discovered to be Grauburgunder. Many wine producers in Germany sell their Grauburgunder as Rulaender. Today, Pinot Gris is often associated with the Alsace region of France, where it makes up about 14 percent of the vineyard plantings. The Alsatian Pinot Gris wines were originally labeled Tokay d'Alsace. It is very popular in Italy, known as Pinot Grigio. Plantings can be found in the Lombardy region and in Alto Adige, Italy's northern most wine region, as well as in the Friuli-Venezia Giulia region. Pinot Gris was first introduced into Australia in the early 1800s. Pinot Gris is grown in both the North and South Islands of New Zealand. David Lett, from Eyrie Vineyards, planted the first American Pinot Gris vines in the US, in Oregon in 1966. 338 Grauburgunder - Pinot Grigios - Pinot Gris were submitted from 151 producers from Germany, Switzerland, Austria, Italy and France. New World producers were absent. The bulk of the producers were from Germany – 133 producers submitting 315 wines. The German Grauburgunder Prizes were awarded in 4 different categories. The top 3 in each category are listed below. The section below also contains some remarks on two winners which I visited recently, the Markgraf von Baden Estate and the Winzerverein Hagnau. Category I: dry (+2.0 acidity, max. 9.0 g/l residual sugar) fruity wine, (not aged or stored in a wooden barrel/barrique) Alcohol content of up to max. 12.5% vol. Among the winners, but not in the top 3 group, was a Birnauer Kirchhalde from Weingut Markgrafen von Baden / Schloss Salem. I visited Schloss Salem a few weeks ago. Salem Castle is one of the finest cultural monuments in the region around Lake Constance in southern Baden-Württemberg. Founded in 1137 by Cistercian monks, the gigantic monastery complex with its agricultural estates passed into the hands of the ruler of Baden, the Margrave of Baden, during secularization in 1803. After 200 years, it again changed hands a few years ago, when the State of Baden-Wuerttemberg bought it, as the family of the Margrave of Baden was unable to maintain it. The vineyard area of Schloss Salem totals 110 hectares. Varieties planted here are mainly Müller-Thurgau and Pinot Noir. The von Baden family had a decisive influence on viticulture in Baden. Großherzog (Grand Duke) Carl-Friedrich von Baden (1738-1811) is regarded as the creator of quality wine production in Baden. In 1782, he brought in 3.500 Riesling vines from the Rheingau region. In the 1920s, the Margrave of Baden was the first Estate in Baden to show faith in the new variety Müller-Thurgau. Since 1998, Bernhard Prinz von Baden has continued the viticultural tradition and manages the Schloss Salem Estate. He also lives there. The original base of the von Baden family is Schloss Staufenberg in the Ortenau, with 25 hectares of vineyard land. These were the only vineyards of the von Baden family until they received the Lake Constanze vineyards as part of Napoleon’s secularization. Category II: dry, fruity wine (+2.0 acidity, max. 9.0g/l residual sugar) (not aged or stored in a wooden barrel) Alcohol content of more than 12.5 - 13.5% vol. I visited the Wine Cooperative of Hagnau, a little village at Lake Constanze in Germany, earlier this year. Winzerverein Hagnau is the oldest Wine Cooperative in the Baden region, founded in 1881 by Pastor Dr. Heinrich Hansjakob. The secularization of 1803, when Napoleon tried to reorganize Europe by expropriating the Church and giving the assets to dukes and margraves that were on good relations with him, had an important impact on the economic situation of the Hagnau winemakers. Before secularization, for about 110 years, the winemakers of Hagnau were under the rule of the Benedictine Abbey of Weingarten. These were not bad days. Under the monastery’s rule, the wine makers received as a reward for their work half the wine yield and a field on which they could grow potatoes and vegetables for self-catering. This changed dramatically after the secularization. The wine makers lost the field on which to grow food and had to bear all costs of wine production themselves, but were paid for their output. As it turned out, prices and revenues kept on falling. In view of the difficult situation of the smallholders, the pastor and civil rights activist of Hagnau, Dr. Heinrich Hansjakob, encouraged them to form a wine cooperative and market their wine themselves. On October 20, 1881, the first wine cooperative of Baden was founded in Hagnau at Lake Constance. It currently has over hundred members. In the regions of Baden and Wuerttemberg in Germany, being a member of a wine cooperative is the rule. Independent winemakers are the exception. The vineyard area of the Winzerverein Hagnau is 140 hectares. The grape distribution is as follows: 40 % Müller-Thurgau, 40 % Spätburgunder, 8 % Ruländer/Grauburgunder, 3 % Weißburgunder, 2 % Bacchus, 2 % Kerner, 5 % other, including Regent. The Hagnauer Winzerverein wine portfolio is broad, focusing on good quality day-to-day wines. The entry wine in the 0.75 liter bottle costs Euro 4.50. This is a tick higher than what you pay in the Pfalz or in Rheinhessen for comparable quality. However, most wines do not exceed Euro 10. One of those beyond Euro 10 is the 2007 Hagnauer Burgstall Spaetburgunder Rotwein Barrique trocken for Euro 14.90, the Haganuer Winzerverein’s best red wine. Category III: dry (2.0 acidity, max. 9.0 g/l residual sugar) Premium wines, "Selektion", "Grand cru", etc. Category IV: sweet wine/dessert wine. You find the list here. The Hot Spot is a Chinese Restaurant in Berlin Charlottenburg, Eisenzahnstrasse 66, just next to the famous Kurfuerstendam, well known for its amazing list of German wines. Mr. Wu, the owner, loves wine and in particular German wine. No wonder that one of the side-events of the 100th Anniversary of the VDP took place at his restaurant. It was a buffet-style dinner with 5 VDP winemakers pouring their wines. Germany’s Prädikat Wine Estates – the members of the VDP (Verband Deutscher Praedikatsweingueter) - celebrated the 100th Anniversary of the VDP in 2010 in Germany’s Capital Berlin during September 4 to 6, 2010. I was happy and proud to participate. There were a number of events with the official ceremony in the Berlin Cathedral at the center. I have given a run-down of the whole series of events here and have reported in more detail on the event: 70 Galleries - 200 Winemakers - 1000 Wines here, on the official ceremony in the Berlin Cathedral here, on Jancis Robinson and Hugh Johnson, who participated in the events, here. and on the Hausbesetzung in the Rutz Wein Bar here. The VDP is the world’s oldest association of wine estates in the world. In fact, as Jancis Robinson said in her speech in the Berlin Cathedral, it is the only one of its kind worldwide. No other country has a national organization of the top wine makers of the entire country. Germany’s prime white wine variety, Riesling, has long been the grape of choice for VDP members. Other, traditional varietals are also cultivated, e.g. the ancient white varietal Silvaner (particularly in Franken and Rheinhessen), and members of the Pinot family, including Germany’s all-important red wine grape, Spätburgunder , and the white wine grapes, Weiss- and Grauburgunder (Pinot Blanc and Pinot Gris, respectively). At first sight, Hot Spot appears to be a regular Chinese restaurant. But once you have eaten there, you know that its Szechuan- and Shanghai-inspired menu really stands out. And once you have seen the wine list, you can understand why Hot Spot has become something of a sensation in Berlin: Hot Spot offers an extensive list of fine German wine. Hot Spot has become the place to go if you want to fine German wine with fine Chinese food. Hot Spot is owned and run by Mr. Wu, 50, who came to Germany in 1984 from Zhejiang. He earned a degree here in engineering but left school and opened a Chinese restaurant. In 1995, he became interested in wine and started to serve French wine at his place. In 2007, Mr. Wu opened Hot Spot with an extensive list of German wine. Jan Eymael from Weingut Pfeffingen in the Pflalz (13 hectares) poured a selection of 3 Scheurebe wines. Peter Jakob Kuehn from the Rheingau (16 Hectares) poured only Rieslings, including his amazing Riesling Amphore trocken , which sells for Euro 43. All Kuehn wines are biodynamically grown in the vineyard and naturally fermented in the cellar. Martin Messmer from Weingut Messmer in Burrweiler in the Pfalz (25 hectares) poured a selection of red and white wines, including an interesting Sankt Laurent “Selektion”. Theo Minges from Flemlingen in the Pfalz (24 hectares) poured a selection of red and white wines including a phantastic Muskateller Sekt brut for Euro 13. The young Sven Leiner from the Pfalz surprised with out of the box grapes, including a Chardonnay trocken for Euro 16 and a Tempranillo for Euro 26. Friedrich Wilhelm Becker, the son of Friedrich Becker from Weingut Friedrich Becker (17 hectares) from the Pfalz poured white and red Pinots, including a complex 2007 Spaetburgunder Kalkgestein for Euro 30. The event was organized by VINICULTURE, one of the best winestores in Berlin.